The Kyser Drop D capo makes your guitar sound like you're playing in "Drop D" without having to change your tuning. By placing the Kyser Drop D capo on the second fret from the top, the 1st, 2nd, 3rd, 4th, and 5th string are higher pitched than the low E 6th string (which rings through). This sounds just like Drop D. The Kyser Drop D capo is also a tool for creative exploring. With it, you can get new, richer sounds from your guitar without having to relearn how to play the chords you already know. Experiment. 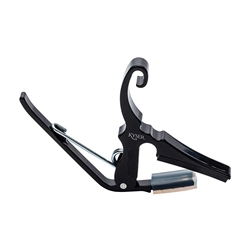 The Kyser Drop-D capo can be used on any fret, in standard or inverted position and opens a new world of alternate tunings.